Chile has a land mass smaller than any other South American republic except Ecuador, but its long coastline (2,700 miles/4,300km) makes it seem enormous. 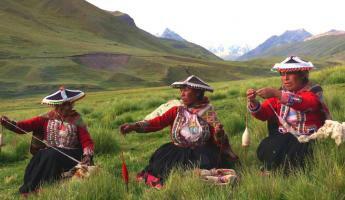 The country is never more than 100 miles (180 km) wide, with the towering Andes Mountains defining its eastern border. At some points the Andean peaks can be seen from the Pacific beaches. The length of the country allows it to host every imaginable climatic zone. In the north is one of the driest deserts in the world - some parts have never recorded even trace amounts of precipitation! Moving south you'll encounter an agricultural valley the size of California, and then a province of mountain lakes and volcanoes - the famous Lake District. 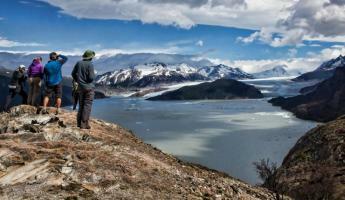 Further south are the wilds of Patagonia, a landscape of fjords, islands, glaciers. Chile's far southern tip points towards the polar ice of Antarctica. This northern area of the country is dominated by the Atacama desert and includes the towns of Tarapaca and Antofagasta. Despite its aridity and tropical latitude, the Atacama is a remarkably temperate desert, moderated by the Pacific Ocean's cool, north-flowing Humboldt current which parallels the coast. Areas of the Atacama erupt with wildflowers in rare years of substantial rain that often follow El Nino weather patterns. Parts of the north of this province support a rich agriculture industry founded on irrigation in the major river valleys, especially in the Elqui. Extensive cloud cover and thick fogs known as "camanchaca" caused by high humidity often encompass the coastal range. This middle part of Chile is the fertile heartland. Agriculture is a mainstay in this area that enjoys a Mediterranean climate, with maximum temperatures averaging 82°F (28°C) in January and 50°F (10°C) in July. The rainy season lasts from May to August. Evenings and nights can be cool, even during the summer. This is the most popular tourist area in the country; snowcapped volcanoes, many of which are still active, frame its numerous foothill lakes. Climatically the area resembles the United States' Pacific Northwest, with pleasant but changeable summer weather and cool, damp winters. Winter brings snow, and skiing is a popular wintertime activity. Puerto Montt's average summer high is 57°F (14°C) and wintertime temperatures average 45°F (7°C). This area south of Puerto Montt and Chiloé covers about 30% of the total land area of Chile. It is a rugged, mountainous area of tremendous beauty. Westerly winds and storms often drop enormous amounts of snow and rain on the seaward slopes. In the Magallanes and Tierra del Fuego areas, temperatures in summer average 52°F (11°C). Dampness and wind chill can make it feel cooler so be prepared by having a number of layers and good waterproof gear with you. The weather year-round is highly unpredictable, and in summer be prepared for incessant winds that do lessen in the winter. In the shoulder season months - November and March - you are likely to find the winds not as strong as they are during the peak of summer. Rapa Nui enjoys a subtropical climate; winds and ocean currents strongly influence the weather patterns. The hottest months are January and February, while the coolest are July and August. The average summer temperature is 83°F (28°C) and the average minimum is 59°F (15°C). The average winter maximum is 72°F (22°C) and the minimum is 57°F (14°C), though when winds blow in from Antarctica with pouring rain it can feel a lot colder. Light showers are the most common form of precipitation with May being the wettest month.